A root canal is a commonly performed dental procedure that can save your natural tooth. 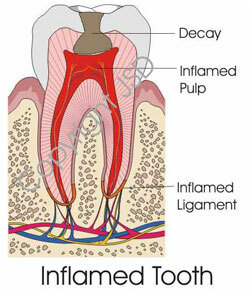 It involves removing the inflamed/ infected tissue inside of the tooth (called pulp), disinfecting the inside of the tooth, filling the canals, and then sealing the tooth to prevent re-infection. A temporary seal will be placed by the endodontist, after which you should return to your general dentist for a permanent seal. Although root canal therapy has a very high degree of success, there are some rare cases that fail to heal. This may be due to the failure of the infection to resolve or the development of a new infection. Retreatment consists of re-opening the tooth, removing all existing root-filling material, disinfecting the tooth, examining the inside of the tooth for possible causes of failure, and refilling /re-sealing the tooth. This procedure usually takes 2 appointments to ensure proper disinfection. There are some cases in which the infection at the end of your tooth cannot be resolved by going through the top of the tooth. In these situations, The root end and infection is removed through a small incision made in your gums. Following the procedure, there may be some discomfort, slight swelling, and/or bruising while the incision heals. As with any surgical procedure, this is normal. To alleviate any discomfort, an appropriate pain medication will be recommended. Injuries to the mouth may dislodge teeth from their socket, or may crack/ fracture teeth.If this occurs, you should come to our office IMMEDIATELY. If the tooth is completely knocked out of the socket, place it in a glass of milk. Do NOT wash the tooth off or let it dry. Immediately come to our office, bringing the tooth with you. If this is done, it may be possible to save the tooth. The number of visits will depend on your particular case. Some treatments take 2 visits but many are just a single visit. Rarely 3 appointments are needed. The number of appointments depends on the degree of infection/ inflammation and degree of treatment difficulty. We believe that it is more important to provide you with the best treatment rather than trying to meet a specific time criteria. 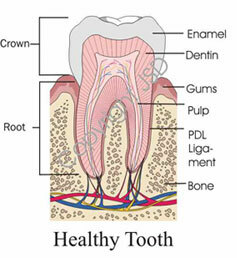 Once endodontic therapy is completed your tooth should be examined periodically, usually every 6 months. This allows us to make sure the tooth has healed or is healing properly. You will be sent a notice in the mail when we feel it is appropriate to reevaluate the area.